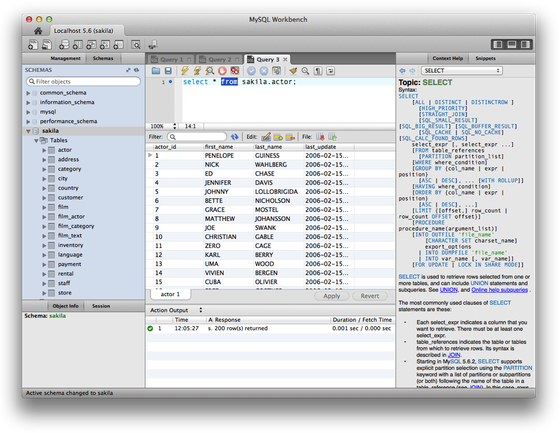 On this page we present a number of screenshots for the main areas of MySQL Workbench. Click on an image to see it at full size. You may have to click on the full size image once it is loaded because your browser may scale the image to fit into the browser window. 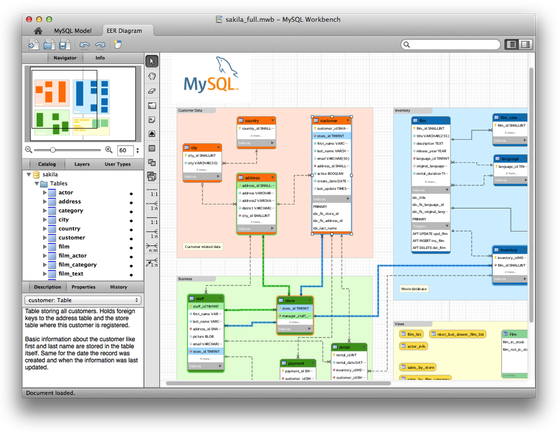 This is your entrance to MySQL Workbench. 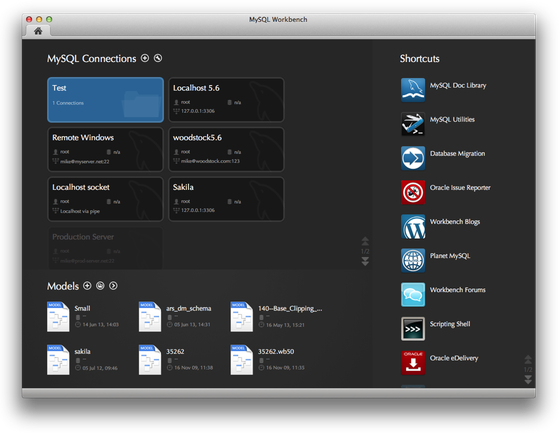 It contains sections for connections, models and plugins (shortcuts) which allow to quickly reach certain parts. 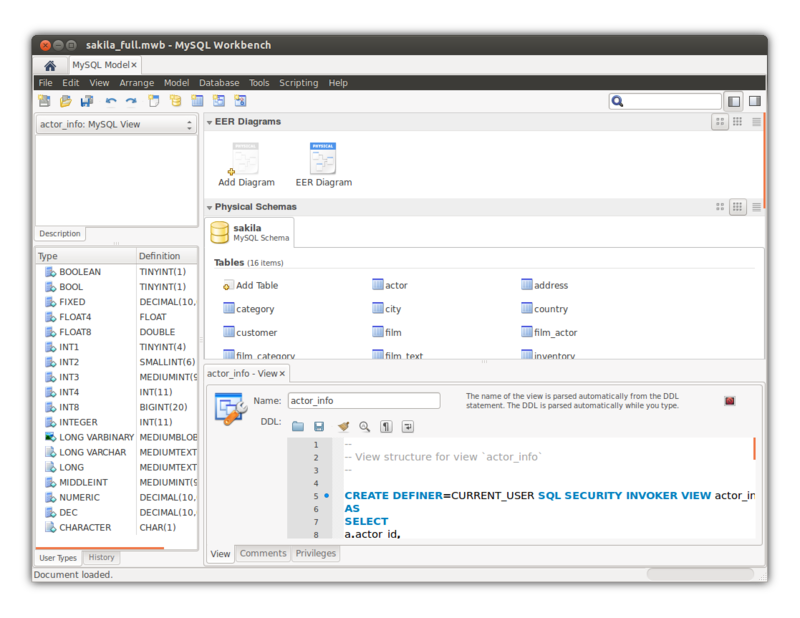 This is your central section for all SQL related work, including directly changing tables and other schema objects in any life database. 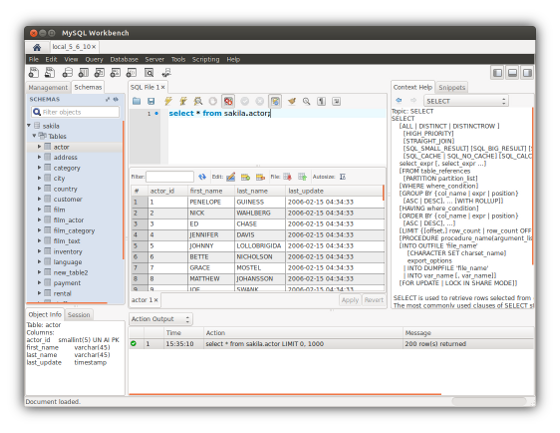 The schema tree lets you browse all schemas on your server as well as their attached objects like tables, views, stored routines, triggers, foreign keys, indexes and columns. A number of powerful tools are available via a context menu, e.g. various clipboard functions, a schema manager (for table repair and other maintenance work), ALTER commands which open specific object editors and more. 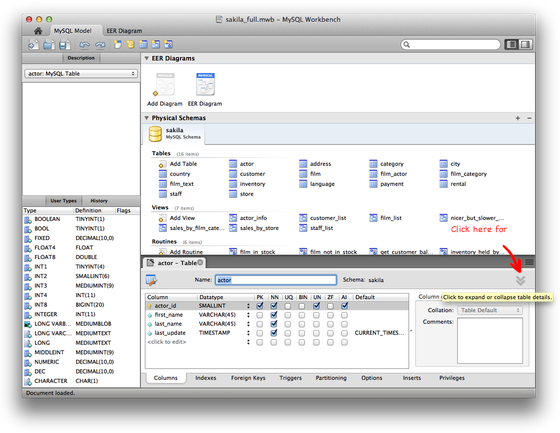 To aid development of SQL scripts there’s a context help feature that dynamically shows help for the SQL part at the caret and a snippet manager for storing smaller script parts for frequent reuse. The management abilities of MySQL Workbench are a discussion on its own. As an example here’s a screenshot from the data export page (aka mysql dump). 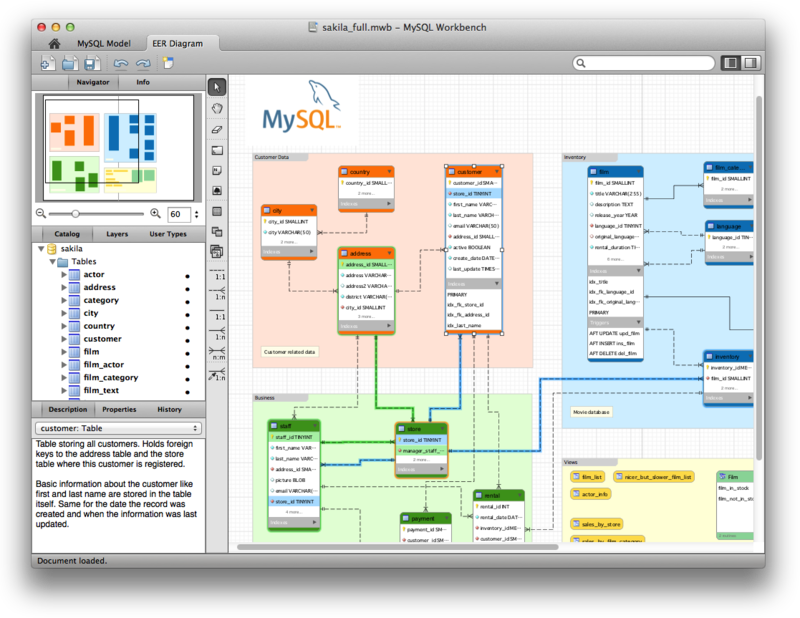 This screenshot shows the MySQL Model Overview page. 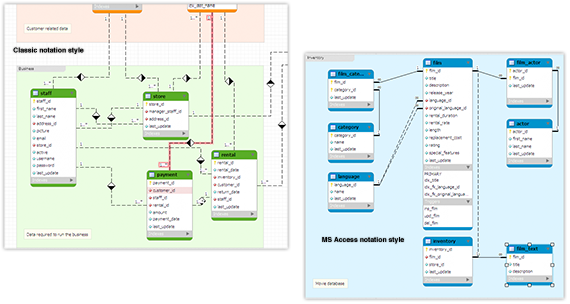 It is the central point modeling and allows the creation and management of diagrams, schemata and their objects, scripts and more. 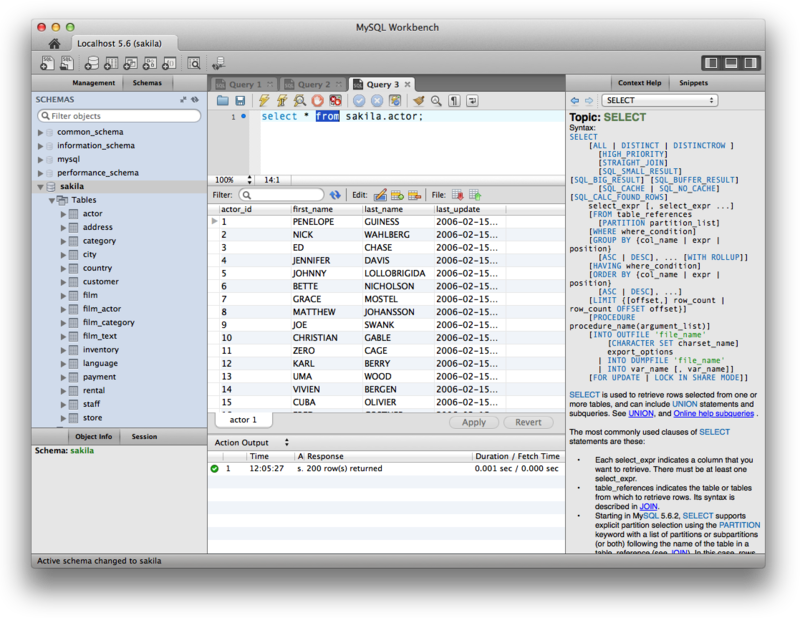 Each Workbench model can hold several EER Diagrams that visualize different parts of the catalog. The diagram can be freely scaled to fit the screen size. A number of different notation styles are available at your disposal. Aside from the default crow foot style, you can also switch to the classic style or one that has been modeled after Microsoft Access, called the “Connect To Column” style. 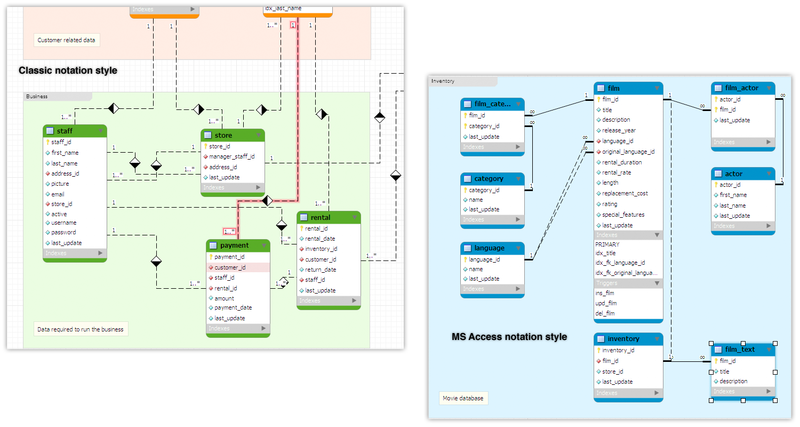 Additionally there are also the UML and the IDEF1X style.